Tickets are now on sale for Uncork Barrington, a charitable wine-tasting event to be held Friday, July 6 from 6:00 - 9:30 p.m. at the Barrington Metra Station-Tent Pavilion. 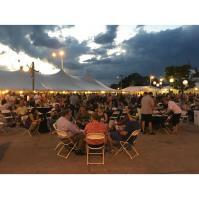 Now in its 14th year, this premier event attracts over 1,000 people from the Barrington and Chicagoland areas to sample wines from around the world, enjoy live entertainment from The Cabernet Cadets, and support important community organizations. General admission tickets are $40 in advance or $50 the day of the event. Admission includes access to over 50 wines, 20 one oz. tasting pours, a souvenir wine glass, a Passport Event Guide, and complimentary nibbles. There will also be food and wine for sale and live music provided by The Cabernet Cadets, an eclectic mix of blues-rock-jazz and a touch of soul with an acoustic flair. Designated driver tickets are available for $25. For a more high-end experience, $90 VIP tickets are available in advance and sell out quickly. VIP guests have access to several high-end wines, dedicated food and a special VIP tent. All guests must be at least 21 years old to attend. An assortment of unique wines and delicious food samples will be offered by local vendors including: Bliss Wine & Gifts, Brunch Cafe, Cooper’s Hawk Winery and Restaurant, Francesca’s Famiglia, Garfields Beverage Warehouse, Heinen’s Grocery Store, Mago Grill and Cantina, McGonigal’s Pub, Neoteca, Inc., Nothing Bundt Cakes, On Occasion Catering & Events, Pepper Park Coffee, Pinstripes, Remember Charlotte’s Pizza, Ruth’s Chris Steak House, UnWined of Long Grove, Vin Chicago, Wild Asparagus, and Wines for Humanity. Sponsors for the event include: Advocate Good Shepherd Hospital, Angel Water, Inc., Bath Planet, Draper and Kramer Mortgage Corp.-Dan Krucek, Erdmann Exterior Designs, GK Development, Inc., Heinen’s Grocery Store, Krumwiede Roofing and Exteriors, Lori Rowe/Coldwell Banker, Marquardt of Barrington Buick-GMC, Quintessential Media Group, Shakou Barrington, The Barn Nursery and Landscape Center and Travelex International. Uncork Barrington is co-hosted by the Barrington Area Chamber of Commerce (BACC), Barrington Area Council on Aging (BACOA) and Barrington Village Association and is an important funding source for local charities. For more information or to purchase tickets to the event visit www.UncorkBarrington.com.